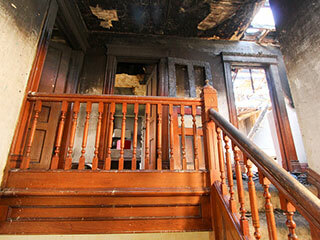 We will be there to asses and repair any damage your home or business had suffered during a fire. Fires have always been a serious risk for buildings, regardless of their nature. It can be a high-rise residential building in the center of town or an office complex, but fire remains a danger one should take all means necessary to prevent, because once it starts, it can burn down the whole place and even cause the loss of lives. But what happens after a fire has occurred? Can the damage be fixed? Can the soot be removed? Reading this article you can better understand what fire and smoke repair service is, and whether it is applicable in all cases. Before we talk about the cleaning itself and when it is possible, it is important to understand that a building, an apartment or any other place that has suffered a fire, probably remains in a condition that doesn't allow it to be used as it should. Soot on walls, debris on floors, a suffocating odor that lingers – all those are the aftermath of a fire, and bear in mind we're talking about the mild consequences of a fire, and not the more severe ones (like compromised structural integrity, for example). Before such a structure can be used once again, it needs to be cleaned and inspected for soot, smoke and debris and undergo a total check of air quality. But, of course, cleaning after a fire is not always an option. Before the cleaning starts, the whole building should be inspected for damage, and that damage should be assessed by professionals. Even if only one room was involved in the fire, it is important to inspect the whole building as fire can travel through walls and electric wires. Sometimes it won't be an option to clean the place up and the whole building or house will be condemned for demolition. Usually that’s the case for houses primarily made out of wood. Assuming it is possible, how can fire and smoke damages be repaired? Well, first, anything that was burned has to be removed, including wall paint, window frames, doors, closets, etc., then, all damaged furniture should also be removed from the house or building. In some cases furniture can be refurbished and restored and removed parts can also be repaired. Everything that was soaked in smoke has to be removed too, as it can affect the air quality. In addition, all ventilation and air conditioning systems have to be fully cleaned or replaced if necessary. Sometimes, the only thing left standing after removing any trace of the damages caused by the fire are the structure's foundations, while all the rest has to be replaced or restored. For professional assessment of fire and smoke damages, you're more than welcome to contact us at Duct & Attic Cleaning Experts, Huston, and our team of experts will be on their way!